If the 2016 presidential election was decided by Hollywood, there's really no question as to which candidate would become the history-making 45th President of the United States. Stars have been voicing their political opinions loud and proud this election season, and needless to say, it is Hillary Clinton who has most celebs' votes. Of course, there are the few and far between who are voting Trump (bye to everyone's crush on '80s heartthrob Scott Baio), but for the most part, Hollywood is certainly #WithHer. In fact, A-listers supporting Clinton are everywhere. At least two Kardashians-Jenners intend to cast their vote for HRC, and practically every pop star (Katy Perry, Lady Gaga, Ne-Yo, Jay Z, John Legend, Cher — you know, just to name a few) will also be checking off a certain name on the ballot come Nov. 8. And then there are all the stars of the small and silver screens (Oprah, Lena Dunham, Sarah Silverman, Elizabeth Banks, Ellen DeGeneres...) who are all planning to vote Clinton. From Kim Kardashian to Morgan Freeman, and everyone (seriously, everyone) in between, check out the celebs who have declared they are voting for Clinton below. Trump may be more of a ~celeb~, but it's clear who has the real celeb vote in this election. Debra Messing has been so vocal about her support for Hillary Clinton that she even spoke at the DNC. But the rest of the W&G cast (that would be Eric McCormack, Sean Hayes, and Megan Mullally) are also proudly #TeamHillary. Will & Grace & Karen & Jack reunited, in character, for a sketch about voting — and also to perform a HRC musical number. 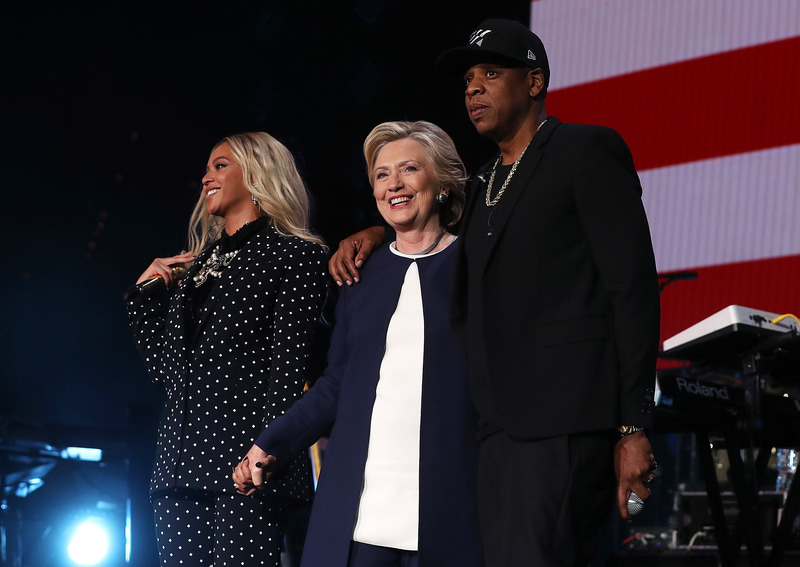 Queen Bey didn't just perform with husband Jay Z at a concert for Clinton — she also delivered a influential and inspirational speech about the power of women voting. The rapper put on a Hillary Clinton concert in Ohio, and his tweet about it pretty much says it all. While there was some confusion as to who Kardashian was supporting, she later clarified on her app that she was "without a doubt" pro-Clinton. "I found that without a doubt, I stand with Hillary. I'm with her. I believe Hillary will best represent our country and is the most qualified for the job," she stated. "This year, I'm not just voting for myself, but also for my children, and I took that into careful consideration when I made my decision." Katy Perry is such a staunch supporter of Clinton that she even dressed up as the presidential candidate for Halloween. Gaga, who has performed at benefits for the Democratic nominee, is Team Hillary Clinton AF. Just look at that "YAAAS" shirt. Jenner showed her support for Clinton with this telling Instagram post. Lena Dunham spoke at the DNC, interviewed Clinton for Lenny Letter, and wrote an op-ed in TIME about why she's voting for the candidate. It doesn't get any more supportive than that, folks. Yes, Clinton appeared on an episode of the hit show, but the actors also voiced their support for HRC in more blatant terms. The black-ish star has been extremely vocal about her support for Clinton, and even introduced her at a campaign rally. Pharrell declared to Variety that all women in the country should vote Clinton. "If all the women in this nation decided to vote and support the first female candidate, there’d be nothing to worry about," he said. " ... I’m praying that women come together and save this nation." The "Really Don't Care" singer really does care about Clinton, even singing at the DNC. Who could forget Meryl Streep's iconic warrior yell at the 2016 DNC? Sara Bareilles is definitely #WithHer (literally). CGM and HRC. Moretz spoke at the DNC and is an active supporter of Clinton. Teigen and Legend (pictured here with a creepily realistic Clinton cutout) campaigned for the presidential candidate in Nevada. Schumer is definitely with Clinton. Let it go, Trump: Elsa herself stands by Clinton. The Scream Queens star rocked her HRC shirt with pride. The Two and a Half Men star frequently tweets (and retweets) his support for Clinton. Alongside Lena Dunham, Ferrera spoke HRC at the DNC. The Supernatural star is definitely #WithHer. The singers are proud supporters of Clinton. Bernie Sanders supporter Sarah Silverman declared that she was 100 percent behind Clinton at the DNC and encouraged other Sanders die-hards to do the same. Cher has supported HRC before, and during this election, headlined a Boston concert in support of the presidential candidate. Elizabeth Banks is so #TeamHillary that she even created this elaborate, celeb-filled music video (complete with a Pitch Perfect-esque version of "Fight Song") in support of Clinton. Basketball great Kareem Abdul-Jabbar endorsed Clinton in a rousing (and funny) speech at the 2016 DNC. Connie Britton is with Hillary, y'all. "I got to sit down and talk with her, and felt her humanity as a mother and working woman, and, most importantly, a woman who is genuinely dedicated to the ideals and values of the people of this country," the Nashville star captioned the selfie with the presidential candidate. "Please. Let's focus. And get back to those ideals." When Clinton stopped by DeGeneres' show, the talk show host took a moment to explain to the candidate why she has her vote. Morgan Freeman's unmistakable voice served as the narration for the short film about HRC's life that was shown at the DNC. Oprah endorsed Clinton in an interview with Entertainment Tonight , explaining that she is, without question, most definitely #WithHer. The actor publicly endorsed HRC and denounced Trump when she spoke at the 2016 DNC. The Eat, Pray, Love writer is on Clinton's side. The Cheers alum has campaigned for Clinton and told The New York Daily News exactly why it is that he supports her. "I admire Hillary Clinton and I'm in awe of her wisdom and knowledge and fierce determination to make things better," he said. The Big Bang Theory star has made her choice loud and clear. Average millennial Will Ferrell is #WithHer (and encouraging others to be, too). Jamie Lee Curtis is not just a vocal supporter of HRC, she's also been outspoken about her hatred of Trump. Well, we certainly know who has the Orange Is the New Black star's vote. Shonda Rhimes is a loud and proud supporter of Clinton. The DJ has been vocal about her support of HRC on Twitter. Ne-Yo totally stands behind Clinton. In an interview with The Hill, he stated that the presidential candidate is a "favorite of mine." "I’m looking forward to seeing what happens with her," he said. "Looking forward to seeing what happens to her when she gets into a position of power." Before hosting a fundraiser for Clinton, George Clooney called on HRC supporters to join him in donating and explained why he is voting for the candidate. "In all of this clutter, there’s been one consistent voice. A voice of tolerance and experience, from a candidate who’s spent a lifetime fighting for the rights of the less fortunate," he wrote in an email letter, according to People. "A candidate who knows firsthand the complexity of our international relationships. That candidate is Hillary Clinton." In a passionate call-to-action, Salma Hayek endorsed Clinton and encouraged all Latinos to vote for HRC. "I like Hillary. I like Hillary. But, you know, it’s crazy because ... I also think Jeb is a good candidate as well," he once told Fox Business (quote via Business Insider). "But, you know, I don’t — I’m a Democrat, so yeah, so I would vote Hillary." JJ Abrams is a proud supporter of Clinton. "I will say we are supporting Hillary. We believe in her as the strongest candidate. She does have the experience and the politics," he told The Daily Beast. "She is compassionate, and right. When I look at the people who need the support that aren’t necessarily getting it, I believe that she would provide that. That is really the way that we have to approach how we vote: Look around and ask yourself, who needs to be brought up? Who needs to be emphasized? Who needs compassion? And I find that that’s something that she’s got." J. Lo encouraged Latinos to get out and vote — and get out and vote for HRC. The always unapologetic Olivia Wilde let her feelings be known. Performing at a concert at the DNC, Snoop D-O-Double-G was ready to get everyone pumped for Clinton. "If you’re ready to make Hillary Clinton our next president, make some motherf*cking noise," he told the audience, according to Variety. The 2 Broke Girls star is definitely #WithHer. If the above 50 celebs haven't yet convinced you to go out and vote, I'll leave you with this: VOTE.